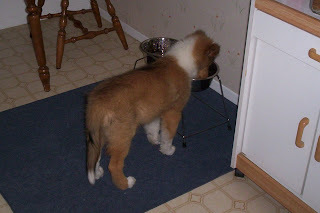 One Collie...Two Actually :): Oh Happy Day! After 2 months of waiting & back ordering, Kort's new bowl set arrived! 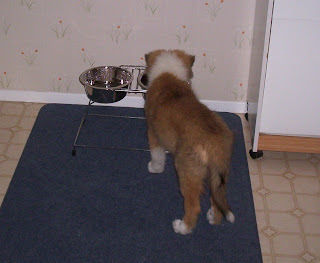 He had been using my old bowls from my very first collie Ben.......yes, I still had them! 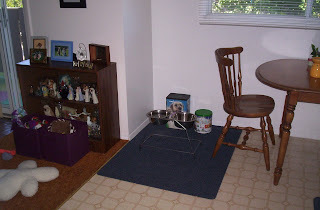 The stand had to be thrown out as it was so rusty, so his bowls were just at ground level. 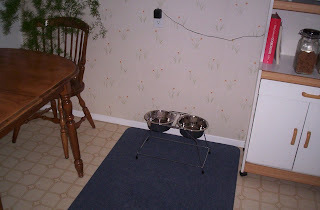 I prefer my dogs to eat from raised bowls. When Kort arrived at the end of June, he couldn't even reach into Tate's, & now he can! He was very excited to try his own out this morning, & now he feels all grown up, just like big brother Tate! He looks like such a big boy now! Jolene, how about showing us a picture of your ornament collection! I can see it in the background.